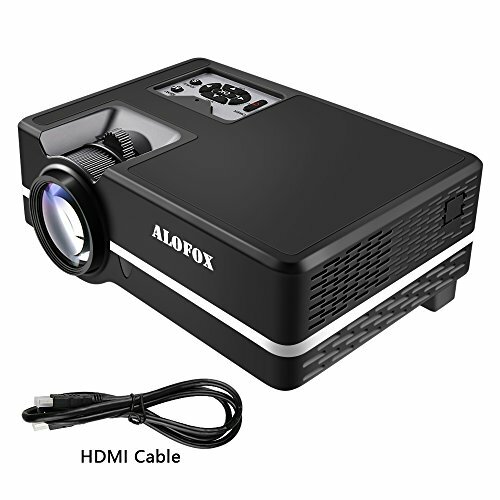 ALOFOX A313 Video Projector provides a 32~150 inches large projection size for you with better visual experience, just likes you are in a cinema. Built-in mercury-free led lamp cares for your eyesight. A good holiday gifts for your family and friends, especially ideal for family gathering. Environmentally Friendly: ALOFOX Home Theater Projector is a environmental friendly device. Low Power Consumption, Durable and Energy Saving - Adopted latest smart eco Lamp care technology, the LED bulb inside can save energy up to 70%, long lasting Lamp life (≥20000 Hours). What's Included:1xMini Projector, Power cord;1 x free HDMI Cable; 1x3-in-1 AV Cord; 1xUser Manual. Offering a 1-Year Warranty for parts and labor. Will refund or replace within the first 2 months if not satisfied with it. Absolutely FREE RISK purchase. If you have any questions about this product by ALOFOX, contact us by completing and submitting the form below. If you are looking for a specif part number, please include it with your message.